The Supreme Court on Thursday declared right to privacy a Fundamental Right, a far-reaching verdict that could impact a range of life choices of Indians, including food habits and sexual orientation. Here’s what the individual judges said in the verdict. The right to privacy of an individual is a natural, cherished, inseparable and inalienable right which is born with a human being and extinguishes with it, Justice Abhay Manohar Sapre said. He said it cannot be conceived that an individual enjoys a meaningful life with dignity, without such a right. However, he also said that this right was not absolute and was ‘subject to certain reasonable restrictions’ which the state was entitled to impose. The judge, who was a part of the nine-judge constitution bench, said the right to privacy was one of those cherished rights which every civilised society recognises in every human being. Justice Sapre held that ‘right to privacy’ is part of the fundamental right of a citizen guaranteed under Part III of the Constitution, but ‘it is not an absolute right and is subject to certain reasonable restrictions which the state is entitled to impose on the basis of social, moral and compelling public interest in accordance with law’. ‘In my considered opinion, right to privacy of any individual is essentially a natural right, which inheres in every human being by birth. Such right remains with the human being till he/she breathes last. It is indeed inseparable and inalienable from human being. In other words, it is born with the human being and extinguish with human being,’ Justice Sapre said in his 24-page separate judgement, which formed part of the 547-page verdict. He said ‘right to privacy’ is not defined in law except in the dictionaries and the courts, by process of judicial interpretation, have assigned meaning to this right in the context of specific issues involved on a case-to-case basis. Justice Sapre added that the most popular meaning of right to privacy is ‘the right to be let alone’. ‘Indeed, it is one of those cherished rights, which every civilised society governed by rule of law always recognises in every human being and is under obligation to recognise such rights in order to maintain and preserve the dignity of an individual regardless of gender, race, religion, caste and creed. ‘It is, of course, subject to imposing certain reasonable restrictions keeping in view the social, moral and compelling public interest, which the State is entitled to impose by law,’ he said. Quoting the Preamble of the Constitution, Justice Sapre said he does not find any difficulty in tracing the right to privacy emanating from the two expressions – ‘liberty of thought, expression, belief, faith and worship’ and ‘Fraternity assuring the dignity of the individual’. ‘...And also emanating from Article 19(1)(a) which gives to every citizen 'a freedom of speech and expression' and further emanating from Article 19(1)(d) which gives to every citizen 'a right to move freely throughout the territory of India' and lastly, emanating from the expression 'personal liberty' under Article 21. Indeed, the right to privacy is inbuilt in these expressions and flows from each of them and in juxtaposition,’ he said. The judge held that right to privacy has multiple facets, and it has to go through a process of case-to-case development as and when any citizen raises his grievance complaining of infringement of his alleged right in accordance with law. The judge was full of praises for all the counsel who addressed the matter before the apex court and said they argued with ‘brevity, lucidity and with remarkable clarity’. ‘The hard work done by each counsel was phenomenal and deserves to be complimented. Needless to say, but for their able assistance both in terms of oral argument as well as written briefs (containing thorough submissions, variety of case law and the literature on the subject), it was well nigh impossible to express the views,’ he said. The right of privacy is a Fundamental Right and has to be protected both against the state and the non-State actors, Justice Sanjay Kishan Kaul said. He expressed apprehension that the growth and development of technology has created new instruments for the possible invasion of privacy by the state, including through surveillance, profiling and data collection and processing. Elaborating on the privacy issue, Justice Kaul used an anecdote that ‘if the individual permits someone to enter the house, it does not mean that others can enter the house’. He said it is an individual's choice as to who enters his house, how he lives and in what relationship. ‘The privacy of the home must protect the family, marriage, procreation and sexual orientation which are all important aspects of dignity,’ the judge said. ‘The right of privacy is a fundamental right. It is a right which protects the inner sphere of the individual from interference from both State and non-State actors and allows the individuals to make autonomous life choices,’ the judge concluded in his 47-page verdict. He observed that in an era where there are wide, varied, social and cultural norms and moreso in a country like India, ‘privacy is one of the most important rights to be protected both against State and non-State actors and be recognised as a fundamental right’. The judge also highlighted the deep digital footprints being created due to reliability on internet, saying online majors like Facebook, Uber and Alibaba have ‘extensive knowledge of our movements, searches and conversations which are sold and analysed for advertising purposes’. ‘Uber knows our whereabouts and the places we frequent. Facebook, at the least, knows who we are friends with. Alibaba knows our shopping habits. Airbnb knows where we are travelling to. ‘Social network providers, search engines, e-mail service providers, are all examples of non-state actors that have extensive knowledge of our movements, financial transactions, conversations -- both personal and professional, health, mental state, interest, travel locations, fares and shopping habits,’ the judge said. He observed that as we move towards becoming a digital economy and increase our reliance on internet-based services, ‘a deeper and deeper digital footprint is being created’. The judge observed that more information is now easily available which has manifold advantages and disadvantages. ‘The access to information, which an individual may not want to give, needs the protection of privacy,’ Justice Kaul said. The judge observed that the data is generated not just by active sharing of information, but also passively, with every click on the 'world wide web'. He said privacy of children requires special protection in a digital age so they are not subjected to consequences of their mistakes and naivety. He also observed that children are perpetually creating digital footprints on social networking websites as they learn their ABCs – ‘Apple, Bluetooth and Chat’. ‘Children around the world create perpetual digital footprints on social network websites on a 24/7 basis as they learn their 'ABCs': Apple, Bluetooth, and Chat followed by Download, E-Mail, Facebook, Google, Hotmail, and Instagram. ‘They should not be subjected to the consequences of their childish mistakes and naivety their entire life. Privacy of children will require special protection not just in the context of the virtual world, but also the real world,’ Justice Kaul said. The judge observed that technology results almost in a sort of a permanent storage in some way or the other making it difficult to begin life again giving up past mistakes. ‘People are not static, they change and grow through their lives. They evolve. They make mistakes. But they are entitled to re-invent themselves and reform and correct their mistakes. It is privacy which nurtures this ability and removes the shackles of unadvisable things which may have been done in the past,’ he said. Right to privacy would remain an inalienable Fundamental Right despite the ‘shifting sands’ of governments in power, Justice Rohintan F Nariman said. Justice Nariman rejected the government's argument that since several statutes are already there to protect the privacy of individuals, it is unnecessary to read a Fundamental Right of privacy into Part III of the Constitution. The judge said a law can be made or unmade by a simple parliamentary majority and the ruling party can do away with any of the protections given the statutes. But, Fundamental Rights are contained in the Constitution so that there would be rights that the citizens of this country may enjoy despite the governments elected by them. ‘This is all the more so when a particular Fundamental Right like privacy of the individual is an inalienable right which inheres in the individual because he is a human being. ‘The recognition of such right in the fundamental rights chapter of the Constitution is only a recognition that such right exists notwithstanding the shifting sands of majority governments,’ he said in his 122-page separate judgment which formed part of the total 547-page verdict of the nine-judge constitution bench. The judge further said statutes may protect fundamental rights and they may also infringe them, and if any statue is an infringement of the inalienable right to privacy, the apex court would then be required to test such statute against such fundamental right. ‘If it is found that there is an infringement of such right, without any countervailing societal or public interest, it would be the duty of this court to declare such legislation to be void as offending the fundamental right to privacy. This argument (of Centre), therefore, also merits rejection,’ he said. An individual's right to refuse life-prolonging medical treatment or terminate life is a freedom which falls within the zone of right to privacy, said Justice J Chelameswar. Justice Chelameswar also said tapping of telephones and internet hacking of personal data is another area which falls within the realm of privacy. He also touched upon other aspects like consumption of food and a woman's freedom of choice on whether to terminate pregnancy. “Concerns of privacy arise when the state seeks to intrude into the body of subjects. Corporeal punishments were not unknown to India, their abolition is of a recent vintage. Forced feeding of certain persons by the state raises concerns of privacy. ‘An individual’s rights to refuse life-prolonging medical treatment or terminate his life is another freedom which fall within the zone of the right of privacy,’ Justice Chelameswar said in his 44-page verdict. He, however, said he was ‘conscious of the fact’ that this issue was pending before the apex court. 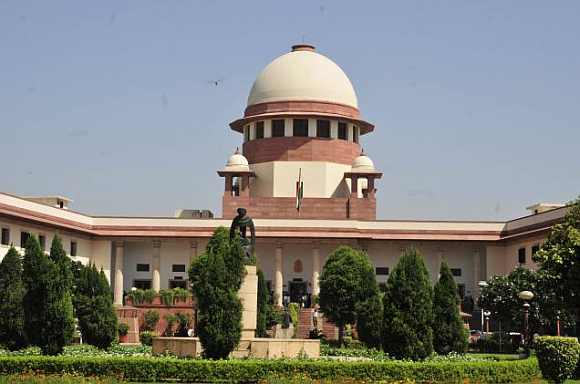 The Supreme Court recently termed as ‘sensitive’ the issue of right to have a ‘living will’ to refuse life support in the last days of an ailing person by declining to adjudicate it and leaving it for the government to take a call. ‘A woman’s freedom of choice whether to bear a child or abort her pregnancy is an area which falls in the realm of privacy,’ he said. ‘I do not think that anybody would like to be told by the state as to what they should eat or how they should dress or whom they should be associated with either in their personal, social or political life,’ Justice Chelameswar said. He apparently referred to the Aadhaar scheme in which biometric data of individuals is collected by the government. ‘Telephone tappings and internet hacking by the State of personal data is another area which falls within the realm of privacy. The instant reference arises out of such an attempt by the Union of India to collect biometric data regarding all the residents of this country,’ he said. He cited various examples and observed that the decision-making process regarding the freedom of association, travel and residence were purely private and fell within the realm of right to privacy. ‘All liberal democracies believe that the state should not have unqualified authority to intrude into certain aspects of human life and that the authority should be limited by parameters constitutionally fixed,’ Justice Chelameswar said. Insofar as religious beliefs are concerned, he said that ‘a good deal of the misery our species suffer owes its existence to and centres around competing claims of the right to propagate religion’. He said fundamental rights were the only ‘constitutional firewall’ to prevent the government’s interference with those core freedoms constituting liberty of a human being. ‘The right to privacy is certainly one of the core freedoms which is to be defended. It is part of liberty within the meaning of that expression in Article 21 (the Right to Life and Personal Liberty of the Constitution),’ Justice Chelameswar said. He also made it clear that no legal right, including right to privacy, could be absolute. ‘Every right has limitations. This aspect of the matter is conceded to at the bar. Therefore, even a fundamental right to privacy has limitations. The limitations are to be identified on a case to case basis depending upon the nature of the privacy interest claimed,’ he said. He also referred to the importance of the Constitution and said it could not be seen as a document written to replace one legal regime by another. ‘It is a politically sacred instrument created by men and women who risked lives and sacrificed their liberties to fight alien rulers and secured freedom for our people, not only of their generation but generations to follow,’ Justice Chelameswar said. He also said that nobody would like to be told what to eat or how to dress, and these activities come under the realm of right to privacy. Justice Chandrachud, who wrote a separate judgment on behalf of himself and three other judges, said privacy safeguards an individual’s autonomy and recognises the ability of the individual to control vital aspects of life. 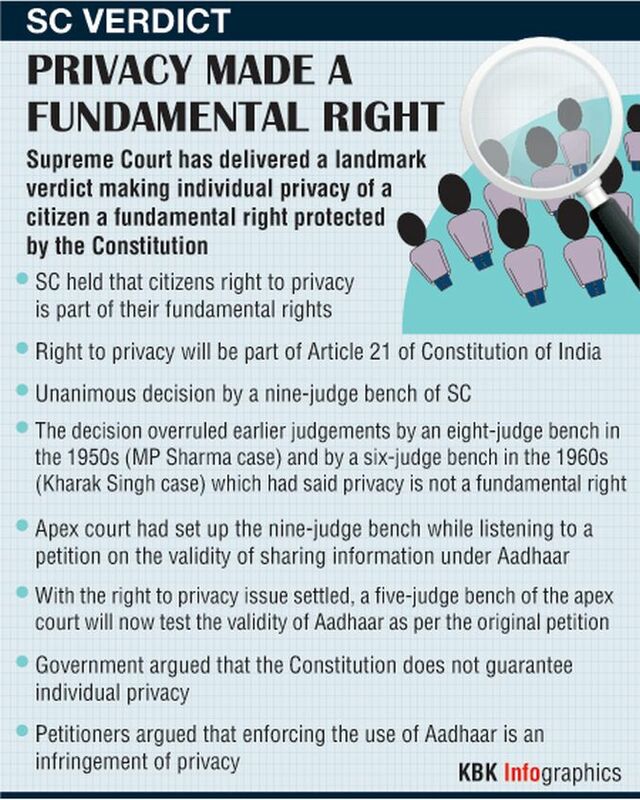 However, the four judges, who concurred with five others in declaring the right to privacy as the fundamental right under the Constitution, said, like other fundamental rights, the ‘right to privacy is not an absolute right’. ‘We commend to the Union government the need to examine and put into place a robust regime for data protection. The creation of such a regime requires a careful and sensitive balance between individual interests and legitimate concerns of the state. ‘The legitimate aims of the state would include for instance protecting national security, preventing and investigating crime, encouraging innovation and the spread of knowledge, and preventing the dissipation of social welfare benefits. These are matters of policy to be considered by the union government while designing a carefully structured regime for the protection of the data,’ Justice Chandrachud, who penned 266 out of the total 547-page judgment, said. ‘In the context of Article 21, an invasion of privacy must be justified on the basis of a law which stipulates a procedure which is fair, just and reasonable. The law must also be valid with reference to the encroachment on life and personal liberty under Article 21,’ the judges said. Elaborating further, Justice Chandrachud said ‘life is precious in itself’ but life is worth living because of the freedoms which enable each individual to live life as it should be lived. The best decisions on how life should be lived are entrusted to the individual. They are continuously shaped by the social milieu in which individuals exist. The duty of the state is to safeguard the ability to take decisions, the autonomy of the individual and not to dictate those decisions, the judge said. ‘Life within the meaning of Article 21 is not confined to the integrity of the physical body. The right comprehends one’s being in its fullest sense. That which facilitates the fulfilment of life is as much within the protection of the guarantee of life. ‘To live is to live with dignity. The draftsmen of the Constitution defined their vision of the society in which constitutional values would be attained by emphasising, among other freedoms, liberty and dignity. So fundamental is dignity that it permeates the core of the rights guaranteed to the individual by Part III. ‘Dignity is the core which unites the fundamental rights because the fundamental rights seek to achieve for each individual the dignity of existence. ‘Privacy with its attendant values assures dignity to the individual and it is only when life can be enjoyed with dignity can liberty be of true substance. Privacy ensures the fulfilment of dignity and is a core value which the protection of life and liberty is intended to achieve,’ the bench said. Justice Chandrachud said the content of the right to privacy has found elaboration in diverse contexts. ‘These would include telephone tapping, inspection and search of confidential documents involving the banker-customer relationship, disclosure of HIV status, food preferences and animal slaughter, medical termination of pregnancy, scientific tests in criminal investigation, disclosure of bank accounts held overseas and the right of transgenders,’ he said. Right to privacy is ‘inextricably bound up’ with all the exercises of human liberty and any ‘diminution’ in it would weaken fundamental rights which have been expressly conferred, Justice Bobde said. Justice Bobde said that privacy is a necessary condition precedent to the enjoyment of any of the guarantees in Part III of the Constitution. ‘Not recognising character of privacy as a fundamental right is likely to erode the very sub-stratum of the personal liberty guaranteed by the Constitution,’ he said. ‘Any derecognition or diminution in the importance of the right of privacy will weaken the fundamental rights which have been expressly conferred,’ the judge said. ‘The right to privacy is inextricably bound up with all exercises of human liberty -- both as it is specifically enumerated across Part III, and as it is guaranteed in the residue under Article 21,’ he said. He noted that existence of zones of privacy was felt instinctively by all civilised people, without exception and every individual was entitled to perform his actions in private. ‘The entitlement to such a condition is not confined only to intimate spaces such as the bedroom or the washroom but goes with a person wherever he is, even in a public place. ‘Privacy has a deep affinity with seclusion (of our physical persons and things) as well as such ideas as repose, solitude, confidentiality and secrecy (in our communications), and intimacy,’ Justice Bobde said. Referring to the ancient texts, he said 'Grihya Sutras' prescribe the manner in which one ought to build one's house in order to protect the privacy of its inmates and preserve its sanctity during the performance of religious rites, or when studying the Vedas or taking meals. ‘The Arthashastra prohibits entry into another's house, without the owner’s consent. There is still a denomination known as the Ramanuj Sampradaya in southern India, members of which continue to observe the practice of not eating and drinking in the presence of anyone else,’ he said. Justice Bobde also observed that it was not possible to ‘truncate or isolate’ the basic freedom to do an activity in seclusion from the freedom to do the activity itself. ‘The right to claim a basic condition like privacy in which guaranteed fundamental rights can be exercised must itself be regarded as a fundamental right. Privacy, thus, constitutes the basic, irreducible condition necessary for the exercise of 'personal liberty' and freedoms guaranteed by the Constitution,’ he said. He said the Constitution enumerates many of these freedoms and their corresponding rights as fundamental rights and privacy was an essential condition for exercise of most of these freedoms. ‘Ex-facie, every right which is integral to the constitutional rights to dignity, life, personal liberty and freedom, as indeed the right to privacy is, must itself be regarded as a fundamental right,’ he said. Justice Bobde said that the first and natural home for a right of privacy was in Article 21 of the constitution and liberty and privacy were integrally connected in a way that privacy was often the basic condition necessary for exercise of the right of personal liberty. He said that there were innumerable activities which were virtually incapable of being performed at all, and in many cases with dignity, unless an individual is left alone or is otherwise empowered to ensure his or her privacy. ‘Birth and death are events when privacy is required for ensuring dignity amongst all civilised people,’ he said, adding that right of privacy is as inalienable as the right to perform any constitutionally permissible act. ‘As a result, privacy is more than merely a derivative constitutional right. It is the necessary and unavoidable logical entailment of rights guaranteed in the text of the constitution,’ he said.